From their booth at the club fair in September, to their posters around school, you may have heard about Bard’s new volunteering club, Lend-a-Hand. This fall, Shannon Khuu (Y1) and Shelli Vodovozov (Y1) created this group , with Ms. Gamper as its faculty advisor, to give students an easier access point to volunteering around the city. If you want to volunteer with a variety of different organizations, but you don’t know where to begin, joining this club is definitely for you. Khuu and Vodovozov have always been interested in helping out around the city, and spent a long time finding and participating in events. They wanted to bring that to the club, and they currently aim to orient the types of work they do around the kids at Bard and their interests. Shelli told us, “When we pick out our events, we make sure to target ones that students our age will actually enjoy doing.” They want the club to revolve around what works best for students, taking into consideration homework, standardized testing prep, and other obligations that some might have on the weekend. The first event of the year was very fun for Shelli, Shannon, and everyone who attended. 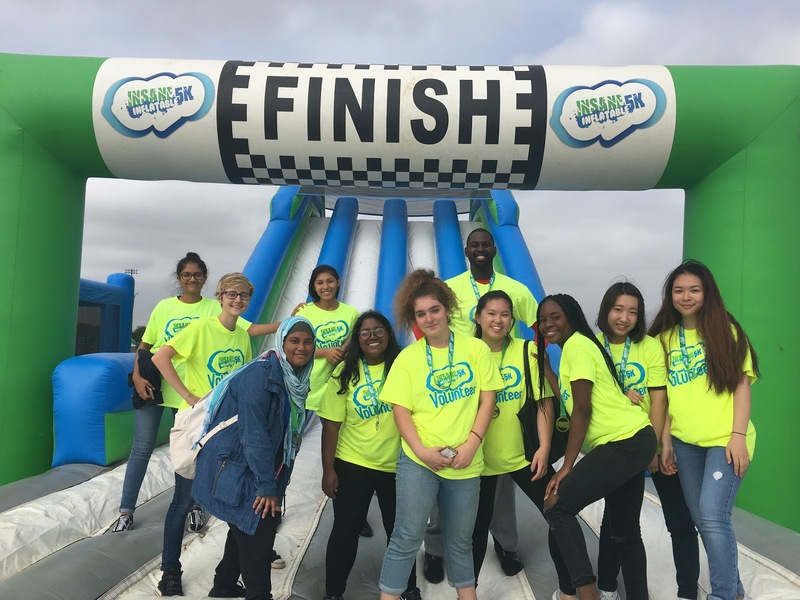 Towards the end of October, the group volunteered at the “Insane Inflatable 5k” at Brooklyn’s Aviator Sports and Event Center. Shelli shared, “We helped out with registering in runners, and once that was done, we worked with handing out snacks and t-shirts.” At the end of the event, they were allowed to run around on the race course, which, they said, was essentially an adult version of a bouncy house. This was a great way to start out the club’s first year, and showed that you can have a lot of fun while doing helpful and productive work. Vidhi Nayee (10th) told us “Since this was my first volunteer experience with Lend-a-Hand, I didn’t really have any expectations but it was really cool to see how much planning went into the event and how everything came together.” Hopefully more students will get inspired by the amount of work that gets put into coordinating these events and will want to help out too! Before the holidays, , the club was working on something very exciting and admirable: collecting holiday gifts to donate to the women’s shelter near Bard. They had a club meeting where everyone brought different presents to school so they could wrap them all together, while listening to Christmas music and eating snacks. BHSEC’s new club, Lend a Hand takes on the Insane Inflatable 5k! The participation has been somewhat low this semester, but after all, this is only the club’s first year. Khuu and Vodovozov hope to get more students involved as they continue to do weekly volunteering events. Shelli explained that “The participants that we do have; however, are just so reliable and dedicated to the club. I would really love to have more students from different grades join Lend a Hand. The club is mostly made up of year 1’s, and when we graduate, we would still love for the club to keep going.” In fact, it is very easy to get involved with them. You just have to attend their weekly meetings on Tuesday at 3:50 in Ms. Gamper’s room (Rm. 313) to learn about upcoming volunteer opportunities. You can be added to their email list or just talk to them in school. If you know you will be free one weekend, go to the meeting that Tuesday to know what event will be taking place! You can also follow them on Instagram, @lend.a.handbhsec, to see pictures from their events. Shannon, the other leader of the club, shared, “We envisioned this club to be full of students who are inspired and energetic students who are as passionate as me and Shelli are in volunteering. It’s been going amazing so far, the amount of dedication these students show inspire me and Shelli every day to find more events for them.” They look forward to the growth of the club!